As the world grows more environmentally conscious and our precious resources like water start to wane in supply, the need for harvesting rainwater is greater than ever. Each year, more and more communities are having to place restrictions on water usage in order for supply to meet demand. These factors and others have led to a growing need for rainwater collection tanks and Buchholz-Smith utilizes its experience in custom tank design to develop tanks for some of the most demanding applications. Whether your rainwater harvesting system requires and above ground or inground tank, we can fabricates tank in nearly any size and in a variety of shapes. Plus, with our extensive experience building complete modules for the plating industry, we are capable of outfitting tanks with all types of plumbing and fixtures for the integration of pumps and irrigation systems. Reinforcing tanks with steel girthing is critical for inground applications as these tanks are often subjected to large amounts of pressure. At Buchholz-Smith, we thrive on these challenges and have a history of fabricating highly durable, long-lasting tanks for some of the world’s most demanding applications. 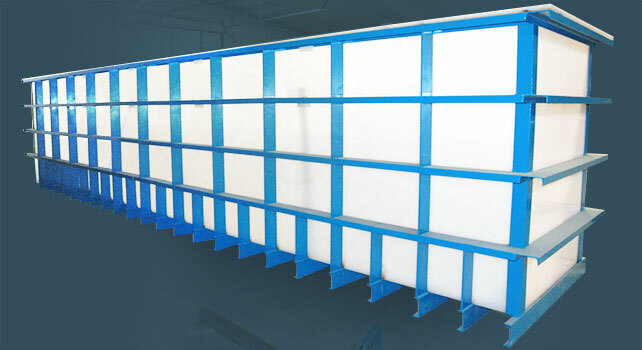 Plastic tanks reinforced with steel girthing are ideal for inground applications.